Autobrain is no ordinary OBD2 Reader. It's a device that keeps track of your car's health and family's safety. GearBrain has tested several OBD2 devices over the past few months and many of these devices are designed to help keep track of your car's health. Now we are starting to see more features added to these connected devices which can turn your vehicle into a connected car. Recently we reviewed a OBD2 device that offered 4G Wi-Fi service and had a mechanic hotline. This hotline allows owners to call a qualified mechanic to help get a reading on why their check engine light was on in their vehicle. We are happy to see another manufacturer integrate this service into a OBD2 reader. Let us introduce you to Autobrain. Autobrain OBD2 Reader and more. Autobrain is a new OBD2 reader that lets consumers understand what's going on with their vehicle, connecting to its computer to understand when things are not going well. Built by tech enthusiasts, first responders and EMT's, the device offers alerts plus a GPS locater, and also has an automatic crash response system to notify authorities of accidents. Autobrain works with any car built after 1995, and each device and subscription covers one car — but you can switch the gadget to work on another one of your vehicles. The company decided to have the device connect directly to a smartphone using a CDMA cellular network, and not Bluetooth, because the Bluetooth signal can be easily shut down, and is a weaker link. Kids are savvy when it comes to smartphones — easily turning off a Bluetooth device if it's tracking where they go in your car. Also, the company informed us using a cellular service connection is better for control of the device. Don't have good cellular service where you live? Autobrain will supply those customers with a device that uses GPS to track your vehicle. 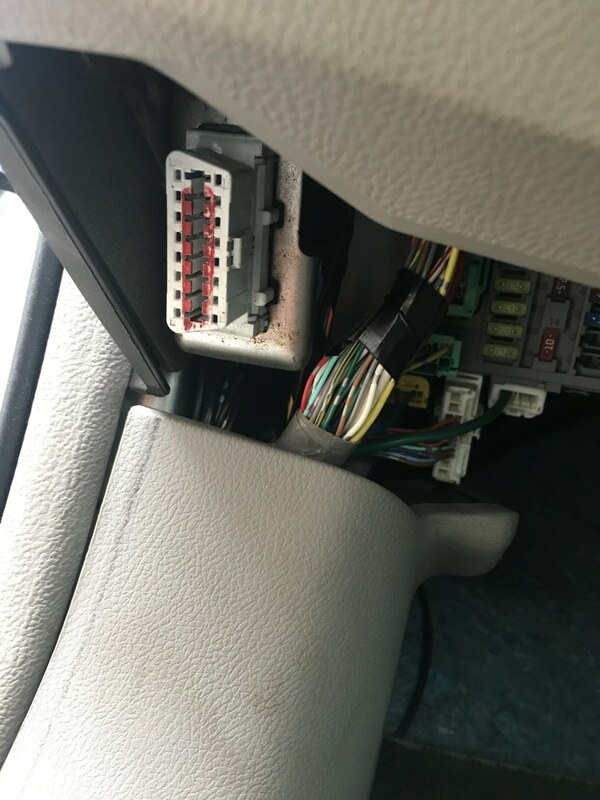 OBD port in GB Test Vehicle located underneath steering column. One Click Safety Modes – There are four different safety modes: families, seniors, teens and babies. Once activated, you get alerts on your smartphone, ranging from speeding and dangerous driving, to curfew alerts and reminders to take your baby out of the backseat. The baby mode can be combined with the other modes — extremely helpful when someone else is traveling with little ones in the car. 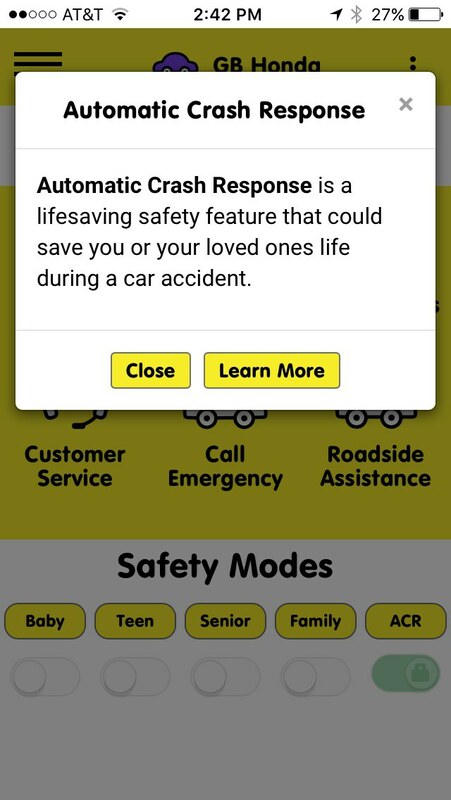 Automatic Crash Response – If you get into an accident and can't call 911, ACR will automatically call an emergency line to direct first responders to your location. Car Finder – This feature monitors the whereabouts of your vehicle. Download the app onto your smartphone and/or tablet to see a car's location. This is a good feature if you have teenagers driving in the household. It will not only show you where your car is, but if the vehicle's moving, while also revealing the speed and the route the car is taking. The feature reminds us of the same tracking you get on the Uber or Lyft mobile app when you are waiting to get picked up. Car Health Alerts – Autobrain notifies you when a vehicle needs to be serviced. If your check engine light comes on, Autobrain will alert you and, if you want, call its live mechanic hotline, which can look for local auto shops, and the prices they quote, to fix the issue. 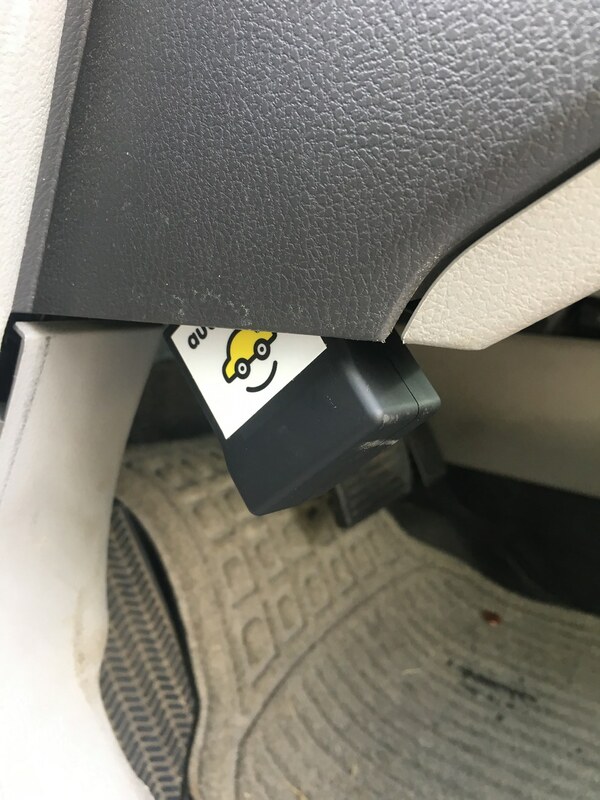 Trip Reports – This feature keeps track of every trip you take with Autobrain connected to your car. It keeps track of the distance and fuel costs for each trip, while recording when a driver was speeding or not driving safely. 24/7 Roadside Assistance – Autobrain provides roadside assistance, with five calls a year. These calls can be for tire changes, tows, or even if you need emergency gas brought to you. Google Maps - Autobrain uses Google Maps as its mapping service. If you have ever used Google Maps, you know it can show a 360-degree view of the location you're looking for on a smartphone. On Autobrain's map, when you go to the Car Finder screen, you see a little figure on the righthand side. Drag this figure over to the car figure, and your screen will convert over to a Google Maps 360 view of that exact location. This was a nice feature we haven't seen before on any OBD2 Device. Here is a quick slideshow for setting up and activating your Autobrain. Keep in mind Autobrain's mobile app is available for iOS and Android devices. Once you download the app, start by creating an account. During the account setup process, you will be required to select the make and model for you car. If you can insert your VIN number, that could be helpful. 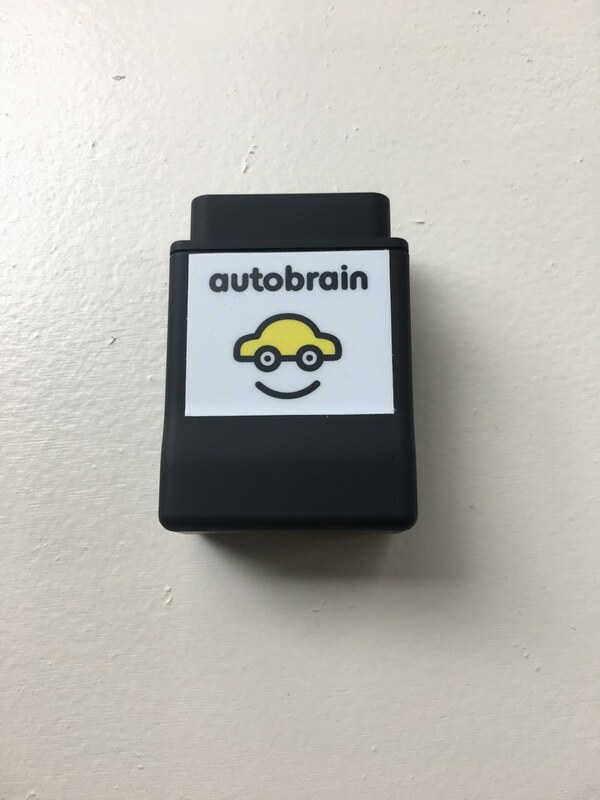 As part of the setup process, you will need to insert the Autobrain device ID which can be find on the backside of your Autobrain device. Setup and Monitor Drivers through Autobrain mobile app. GearBrain recommends taking the time to read through this section so you can choose the correct mode for your Autobrain device. There are three safety modes for your to choose: Teen, Family and Senior. You can easily switch between modes/car based on who is driving the car. Setup alerts while car is moving or parked. These alerts are good to setup especially if you have teenage drivers. This will be the screen you will utilize most when using your Autobrain. On car finder screen, you can track the location of your car as well as its status. If the car is moving, it will show you the speed. Autobrain uses Google Maps for their mapping features. When looking for your car using Autobrain car finder, you can click on the human icon on the lower right hand side of the screen and drag it over to your vehicle icon. The screen will switch to Google street view on Google maps. Why would you want a device like Autobrain? According to Autobrain, car accidents are the No. 1 cause for teen deaths in America. More teens have died in car accidents than break-ins or home fires. For parents with teenage drivers in the household, Autobrain not only keeps track of a child's location but shows how well they're driving — plus offers a little peace of mind in knowing that if the car breaks down, there's roadside assistance at the push of a button. Besides safety, Autrobrain has built in tracking capabilities. If a car's stolen, you can track its location using the GPS feature. If the device is unplugged, you will get a message saying it's unplugged, with the last known location on the app. If the car is speeding you not only get alerts, but can go to the car finder screen and see where the car is and how fast it's going. Besides keeping track of your car's health — and keeping an eye on your car's whereabouts — Autobrain's roadside assistance, mechanic hotline and automatic crash response feature are ones we like. Only one other manufacturer offers a mechanic hotline and we think this is a solid feature in an OBD2 device. To get to the mechanic hotline, you first call customer service, which assesses the problem and either helps you solve it or has a certified mechanic call you back. We called customer service when we had an issue with our Autobrain mobile app. While we had to wait a period of time, a customer service representative did help us understand that while the app was telling us we had a low battery, our battery was actually fine. When Autobrain is doing upgrades to its system, there can be delays in the updates for your car's readings and alerts: Something to note. A few hours later, we looked at our app and saw our car battery was fine. Autobrain costs $29.97 with a monthly subscription of $9.97 (no additional taxes or fees). Shipping is free. You can try the service free for one month with purchase, and there are no contracts required nor any hidden frees. If you don't like Autobrain, there is no charge for cancelling, and there is a 30-day money back guarantee. Autobrain is available on its site and at Walmart. But keep in mind if you buy Autobrain at Walmart, pricing is less (only $19.97) but does not include the free first month of the subscription fee. Autobrain inserted into GB Test vehicle. Be careful not to knock it lose when entering/exiting your vehicle. Hum+ costs $29.99 and has a $20 activation fee. HumX costs $99 and a one-time activation fee of $20 and requires you commit to paying the subscription fee for two years. Autobrain costs $29.97 and has no activation fee. HumX has a monthly service fee of $15 plus taxes and fees. Autobrain offers $9.97 monthly subscription fee with no additional taxes or fees. Autobrain's monthly service fee covers the monitoring of a car and access to on-call mechanic, roadside assistance, etc. At first, we thought this price was a little high but when you think about what the normal cost for roadside assistance from someone like AAA (annual membership costs $52 per year plus a $15 one-time enrollment fee), the monthly cost is not too bad. In essence, you are paying only $5.64 per month or $67 annually for the on-call mechanic, GPS tracking, automatic crash response and tracking your car's health. You have to decide if this is worth it for you and your family. If you have many drivers, it might be a good investment. Verizon HumX's monthly fee covers mechanic hotline, GPS tacking, roadside assistance, emergency assistance, storage of gas usage, speed, distance and driving scores. It also covers 4G Wi-Fi Service. If a Verizon Wireless customer, you can use data from your cellphone plan to help offset some usage fees for Wi-Fi. One feature we like about Autobrain is it can be used on multiple cars and you do not have to call customer service every time you change vehicles. For Verizon HumX owners, you need to let customer service know you are changing vehicles but not with Autobrain. Just make sure you rename the car in your app when you switch cars so you know which car you are monitoring. Verizon HumX offers 4G Wi-Fi service and Autobrain does not. For some car owners, this is a nice feature to have, especially if you take several long trips a year. Autobrain inserted into GB Test vehicle's OBD port. Some vehicles the device might not stick out as much as our's did. OBD2 devices are evolving in our new connected world. We are starting to see these devices become more robust and valuable tools for consumers who want to learn more about their car's engine. 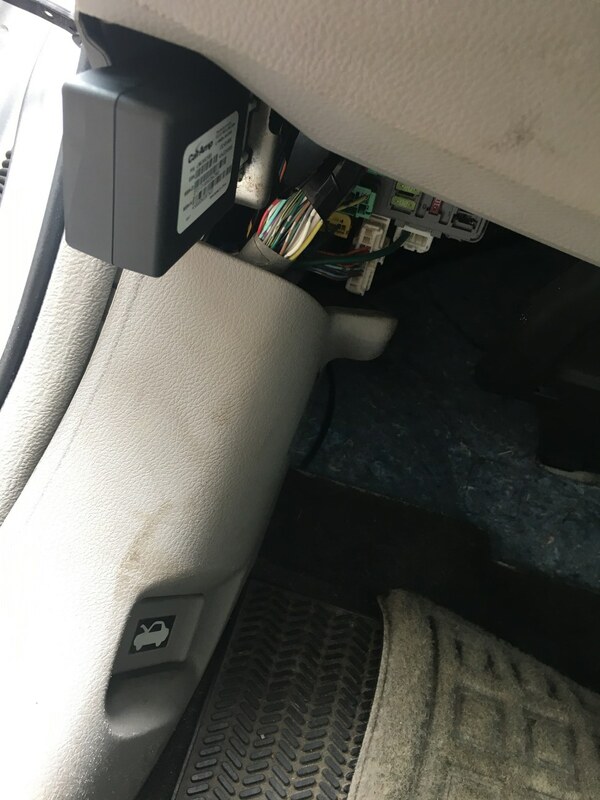 They want to keep track of their vehicle's performance or know if an unwanted guest decides to take a joy ride in their car, they can alert the authorities. And now we are starting to see new innovative services like 4G Wi-Fi service or mechanic hotlines integrated into OBD2 readers. Autobrain is one of these new OBD2 manufacturers who has come to market with a good OBD2 device which offers all of the standard features plus a few key services at an attractive price. The company informed us some of the best and biggest driving schools in the country, like Top Driver are using Autobrain. And, they have won the prestigious National Parenting Product Award. If you are in the market for an OBD2 device and want to use it just to check your car's health, this product is not for you. However, if you want an OBD2 reader that comes with roadside assistance, GPS tracking and automatic crash response service, and have no problem paying a monthly fee for these services, then Autobrain is a product you need to consider. We just wish it also offered Wi-Fi service. Hopefully they will in the near future.